Baking as a banter – it’s not that simple! 31 October 2015. In my BB days – Before Banting that is – I was a formidable baker. As in – I baked often endlessly – cakes, muffins, biscuits, crumbles, lemon tarts, petit fours …….. and never on a small scale – it was usually a batch of 24/36 at a time because there was always someone who needed a “bit of baking” in my mind. I associated my mother’s baking on a Sunday with all that was wonderful about my childhood – the feeling of love and warmth and satisfaction has never left me to this day. I vowed when I had my own house I would fill it and my family with sweet goodness. And fill them – and everyone else I know – I did! That was then. This is now. Sugar free days – 71 now and counting. Or not. It has become such an easy way of life that I have almost forgotten that I loved it so much. Mind you, I rarely ate my own baking – I suppose that’s not a great recommendation for what I made but it didn’t appeal. I felt wonderful filling others up with what I made – then I ate a few Boosts or Starbars in the background, congratulating myself for my abstemiousness in regard to what I had baked! So this is a big challenge for me. I love the act of baking. I love to fill the house with the smell of freshly baked goods. I need to find stuff I can make that creates that feeling of satisfaction without affecting the food plan. Trying to get our children to give up the sugar completely will be another day’s task but for now at least Paddy and I are going for it! 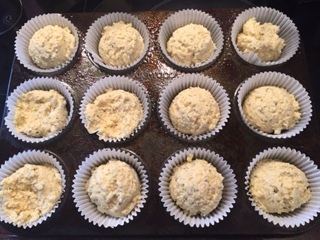 So yesterday I baked a sugary and delicious coffee cake – not at all banting friendly, but then followed it up with these divine little tastes of heaven – cheesy muffins – they are really good – and again – another recipe that can go into the freezer for a busier day! They are from the Real Meal Revolution website – a free recipe there – one to get children eating more healthily. The only difficulty with that in our house is that none of our children likes cheddar. Sigh. Working on that but not hopeful! 200 gms grated mature cheddar and some more for decoration. Mix all the wet ingredients together in one bowl and all the dry ingredients together in another. 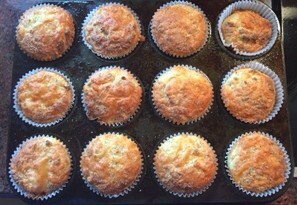 I use an ice-cream scoop to fill my muffin cases and I also apply some Carlex spray – a baking spray to prevent sticking. It is very difficult to get – I found it in the CookShop in the Buttercrane Centre in Newry – it may be available online but I’m not sure where you would get it – it’s not necessary and any cake release would work – I just find that one brilliant. Anyway, after filling the muffin cases I put some cheese on top and gave them an extra sprinkling of Himalayan Salt. They cooked for about 30 minutes – I kept an eye on the oven – and came out filling the house with a most beautiful baking aroma – they also tasted great. These would work well as a side with chowder, as a breakfast on the go, or as “bread” for lunch if you feel that there is still something missing on your lunch plate. They tasted slightly coconutty and the almond flour felt very rich and moist. There is a hint of sweetness when you use almond flour that is quite intoxicating actually. 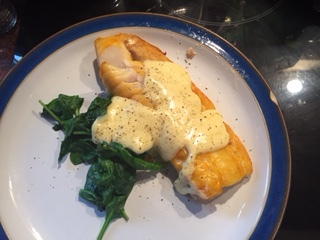 In other news this week I made a very quick and tasty banting cheese sauce for Paddy’s smoked haddock lunch yesterday – I boiled up some cream and threw in a bit of grated cheddar – would work really well with blue cheese if you are a fan – and then added a good grind of black pepper – paired it with some spinach – delicious! 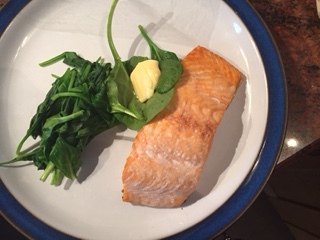 I had some salmon with the spinach and just added a bit of butter to mine. 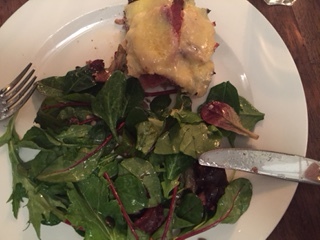 We also went out to dinner in one of our favourite restaurants in Drogheda on Thursday evening – The Eastern Seaboard – a gorgeous New York style eaterie – it was the alternative to spending two nights away in Galway – the girls loved it. 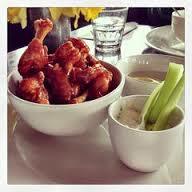 Our baby has discovered a passion for ribs that is stunning to behold and our eldest girl has discovered chicken wings! 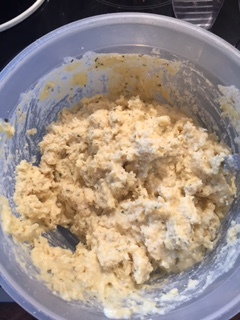 Mind you the chicken wings in The Eastern Seaboard are out of this world – and also contain so much sugar in the sauce that we had to find an alternative – which we did – crab claws in lemon butter – yum! Those wings though ….. They brought them to the table with the dressing on the side so I had one which was dusted in a tiny bit of flour, and then I ate the side of celery in a sour cream dressing. I shared the claws with Paddy. For our mains we both had the burger – which is what we always have – but we asked for them sans brioche bun, and I got a side of salad greens in a vinaigrette dressing. When it came it had toasted seed on top – an extra little bonus I wasn’t expecting. It tasted fabulous and really I didn’t miss the bun. I felt very full after. The bonus for me was that our children had starters and mains and then were too full for dessert. So a less sugar fuelled trip than is usual when we eat out – always a good result. Work beckons again on Monday so I’m not sure if I’ll get to bake any more before then. I’m giving in for now on the sugarfree treats – apart from the coconut pancakes, the deconstructed crumble and the chocolate pots – that’s enough to keep us going – I have made red velvet cupcakes for the junior party goers – and at least there’ll be plenty of people to eat the extra – there’s always the freezer for when visitors call! Keep it up Orla. Do you buy (expensive) coconut flour? Once I used a coffee grinder to grind desicated coconut and it seemed to work well. Thanks Oonagh! I bought it once but will be grinding my own next time. It’s like the very costly “almond flour” – cheap as chips when they call it ground almonds! Previous PostPrevious Cottage pie, but not as you know it. 29 October 2015. Next PostNext Some like it hot! Curry etc…. 11 November 2015.